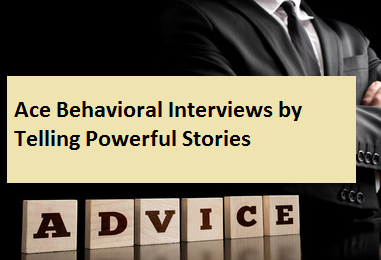 In this article 'ace behavioral interviews by telling powerful stories', you'll get more information and details help with your career knowledge, feel free to copy or share. Behavior-based interviews have been around for more than a decade, but if you aren't prepared for them, they can throw you for a loop. You know that you're in a behavior-based interview when most of the questions begin with statements like, "Tell me about a time when..." and "Describe a situation where...."
The premise behind behavior-based interview questions is that past performance is the best predictor of future success. To determine past performance, candidates are asked to provide specific examples that show interviewers whether they have key skills and experiences needed in the job. Usually, these questions are framed around the specific job description. Michael Rosenband, president of jobgob! LLC, a career-management firm in Chicago, coaches job hunters on how to prepare for these interviews. The key, he says, is to identify the examples that you want to use beforehand and learn to recount them as stories so that you don't get caught flat-footed during the interview. Mr. Rosenband remembers many awkward moments with candidates who were unprepared for these kinds of questions when he was vice president of marketing and business development for Morgan Marshall Industries, a retail-store-fixtures maker in Chicago Heights, Ill. "You could tell that they hadn't done their homework," he says. "Their responses were all over the map." Unlike traditional interviews, a behavioral interview usually requires you to provide specific examples of how you acted in the past, instead of sharing your opinion or thoughts. To prepare effectively, think about what you've done or experienced that most closely relates to what your potential employer needs to be successful. It helps to get as much insight as possible into what the employer is seeking. "Review the job description to figure out what the employer is looking for so that you're able to relay skills and experiences that are on-point," says Mr. Rosenband. When it comes to due diligence surrounding job interviews, Mike Lorelli, chief executive officer of Latex International in Shelton, Conn., is a maestro. Last July, the 52-year-old Mr. Lorelli landed his new CEO role less than a month after he helped negotiate the sale of his former employer. To prepare for job interviews, Mr. Lorelli first spends about 20 to 40 hours researching a company. He studies its Internet site and replays audio interviews or Web casts that are often available on sites of publicly traded companies. "Read the last four or five questions and listen to the speeches given by senior managers," says Mr. Lorelli. "Listen to how people speak. It will give you a good sense for tone, cast and character of a company." He also reviews an employer's stock prospectus and its Form10-K report for facts about top-management compensation, stock options, bonuses and employment contracts. "Read everything you can, even the footnotes," he advises. Hoovers.com and other Web sites that profile companies also can provide information about potential employers. This kind of targeted information allows you to home in on what a company is looking for, eliminate extraneous anecdotes and position yourself as a very focused candidate who understands an employer's needs and priorities. Start by describing the problem or situation that you faced. "Because of the escalating price of ingredients in our products, we needed to rethink our production, pricing and marketing strategies and processes." Describe the action that you took. marketing managers - both individually and collectively -- to determine whether we needed to revise our product formulas, develop new brands and open up new channels of distribution." "When we discovered that our product was too expensive for its original target market, I was able to work with the purchasing manager on a strategy to identify, solicit and negotiate less expensive contracts. I also worked closely with the marketing manager and the marketing team to reposition our product for a more upscale clientele. This resulted in a $200,000 decrease in expenses and $250,000 increase in net revenues." Too many candidates jump into a description of their actions without fully describing the problem or situation, says Mr. Widelka. This makes it seem as though they don't understand the larger business picture or appreciate how their actions contribute to the firm's business goals and strategy. "Candidates need to spend as much time describing the situation or problem as they do describing their own actions," he says. "Some people get so caught up in the description of their activities that they never even get to the results." When you advance to your actions, always recount your most significant accomplishments or contributions, advises Laurie Anderson, an organizational psychologist in Oak Park, Ill. "And talk about why it was so challenging," she says. "If it didn't get hard, it wasn't a real accomplishment." She emphasizes the importance of recounting your behavior as a story. "Your actions always speak louder than your words. Don't tell me who you are; tell me what you did," she says. Interviewers usually frame their questions around the traits or skills deemed essential for success in the position or organization. At Morgan Marshall, Mr. Rosenband prepared to conduct interviews by developing a checklist of behavioral questions. "I was looking for two primary things: cultural fit and ability to perform the job," he says. To answer the question of cultural fit, he looked for a "can-do attitude." Could the candidates execute? Or did they get mired in the details? How you tell your stories will say as much about your performance as what you tell. If you can't tell a story comfortably, you probably shouldn't be telling it at all. It's important to know why you are using a particular example and what you want it to demonstrate. Don't recount a story that lacks a happy ending or portrays you as ineffective. One information-technology professional wanted to demonstrate "execution skills" during a behavioral interview. But when describing how he implemented certain financial software programs and processes, he got so bogged down in the details about the implementation that he never described the results. Leaving out the results is like leaving out the punch line to a joke. The listener won't appreciate the value of the story. It's impossible to anticipate every question, so knowing how to think on your feet is important. Give thorough forethought to the stories (or examples) you want to relate and then rehearse until you can tell them flawlessly. "The best stories are those you can tell with energy, enthusiasm and confidence," says Mr. Rosenband. Although you may be understandably anxious when confronted with a behavioral interview, don't sabotage yourself by being negative. When you say negative things about yourself or anyone else, you introduce an element of hostility into the interview. By putting a positive spin on your answers, you keep the tone of the interview positive. After you tell your story, ask for feedback. Is this the kind of information that the interviewer was looking for? Or would they like you to give a different example? Don't be afraid to say "I don't know" or "nothing comes to mind" when you're asked a question. You can't invent experiences (positive or negative) that you don't have. Interviewees also can use stories to demonstrate character traits. When a candidate for a job as a high-school football coach was asked about his dedication and commitment, he described a hectic two days when he took an injured player to the hospital and waited in the emergency room until nearly 2 a.m. for the player to be released. After leaving the hospital he took the player home, dropped off the next week's game film to another coach, picked up two other players from their homes and drove them to their SAT exams. During the SAT exam, he watched and analyzed a game film and returned the film to someone more than an hour away before picking up and taking the players home.